BYREDO presents a new perfume gesture inspired by Japanese theatre: Kabuki perfume. 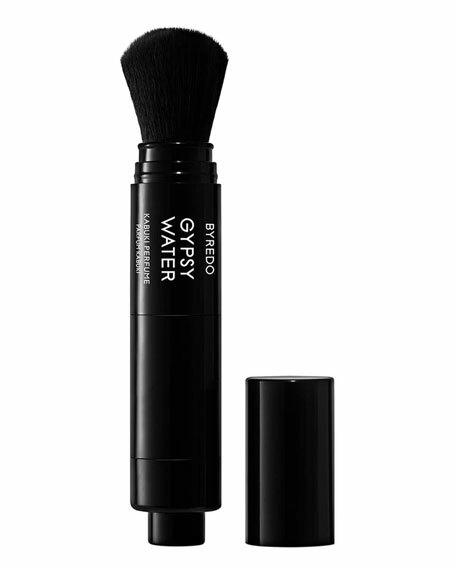 Gypsy Water is available in a soft powder applied in the hollow of the neck, dusted over the entire body, or layered over the traditional spray version. Remove cap and slide down the protective cover. Press button at the bottom of the Kabuki Perfume to release perfumed powder. For the first time use tap the product firmly, hold brush facing upwards and press button repeatedly until pwder appears, repeat steps if necessary. 9 mL/ 0.3 fl. oz. For in-store inquiries, use sku #2256141.